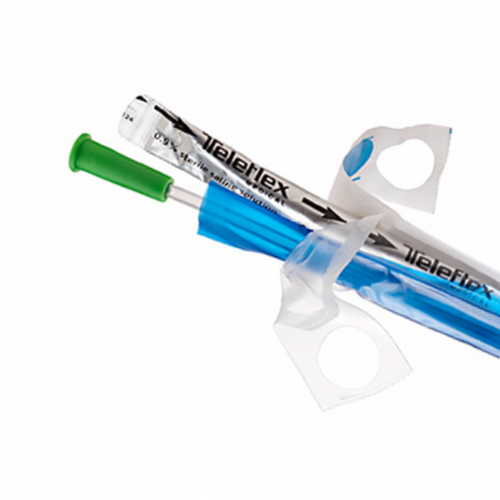 FLOCATH QUICK Male Hydrophilic Intermittent Catheter is manufactured by Teleflex Rusch. Respected in the medical supply industry for their catheters, Teleflex Rusch is also known for a broad range of invasive and noninvasive, disposable or reusable devices for urology care products. This Rusch FLOCATH Quick Hydrophilic Catheter comes in an integrated package containing a hydrophilic-coated flexible PVC Catheter and a sterile saline solution pouch. The FLOCATH Intermittent Catheter glides easily into the urethra after being activated by the 0.9% sterile saline solution. A patented sheath on the FLOCATH Catheter maintains and protects this sterile catheter during insertion, and facilitates sterile catheterization techniques without additional gloves or messy gels. Integrated package includes catheter and sterile saline solution pouch. Size Range: 6 French - 16 French.